It may be the most exciting concept in neuroscience that most people have never heard of. Eric Kandel’s Nobel prize in 2000 on ‘neuronal learning’ in the brain laid the basis for it. It’s become a possible model for Multiple Chemical Sensitivity (MCS) and Post Traumatic Stress Disorder (PTSD). Dr Leonard Jason believes it may explain Chronic Fatigue Syndrome (ME/CFS) as well. It’s called ‘Limbic Kindling’ and CAM magazine contributing editor and Health Rising blogger Niki Gratrix, (BA, Dip ION, mBANT) introduces it here and highlights its possible connections with infection and toxins. Limbic kindling is a condition where either repeated neurological exposure to a sub-threshold stimulus (i.e. one that does not produce problems), or a short-term high intensity stimulus (e.g. brain trauma), eventually leads to a persistent hypersensitivity to that stimulus. Kindling was originally discovered in 1967 by Graham Goddard while studying the effects of electrical stimulation of the amygdaloid complex in the brain on learning in rats. (1) Similar to the work of Eric Kandel, he found that long-term, low intensity and intermittent electric shocks to their brains caused rats have spontaneous, epileptic-like seizures – even when no stimulation was given. The limbic system regulates the autonomic nervous and endocrine systems and the emotions, memory and even smell. Is it ‘on fire’ in ME/CFS? In 2009, Dr Leonard Jason and his colleagues suggested that chronic long- term hyperarousal of the central nervous system – a form of limbic “kindling” – could lead to chronic sympathetic nervous system arousal which cause many of the physiological abnormalities documented in ME/CFS patients. Has an activated sympathetic nervous system impaired the ability to detox as well? Stress was identified as a primary cause of pyrroluria (compromised haemoglobin synthesis) by the late great Dr Carl Pfeiffer, one of the co-founders of orthomolecular psychiatry. McGinnis et al have shown that pyrroluria may also be linked to leaky gut appears able to induce porphyria – a “downstream” cousin of pyrroluria that is associated with dysfunctional heme-producing enzymes. This in turn down-regulates the CYP450 liver enzymes (11). Many patients with MCS have been found to have porphyria (a topic covered in CAM in October 2012). Pyrroluria also results in excessive vitamin B6 and zinc excretion, which would slow the methylation cycle, again reducing the ability to detoxify. Also of great interest is the possible link between chronic stress and lymph stasis. Dr Raymond Perrin, an osteopath specializing in ME/CFS, hypothesizes that cranial lymph flow becomes dysfunctional in states of chronic stress (12). The cranial lymph flow is stimulated by a rhythmic pump governed by the sympathetic nervous system. Perrin has developed a form of deep lymphatic massage called the “Perrin Technique” specifically for ME/CFS (13) and has published two studies on his work with ME/ CFS patients. (14, 15) A 2010 UK survey of more than 4,217 patients by the ME Association found that the Perrin technique ranked number three (after pacing and relaxation) out of 25 types of treatment (16). The limbic kindling model explains how multiple types of stressors (psychological, electrical or chemical) all result in the same outcome: chronic sympathetic nervous system activation that reduces the body’s ability to “rest, digest and detoxify”, and often results in allergies and hyper-sensitivities. Limbic kindling could also explain electro-hypersensitivity. The biochemical changes resulting from chronic sympathetic nervous system activation include increased oxidative stress, inflammation and toxin build-up, which in turn, causes more limbic kindling and could explain how illnesses like ME/CFS and MCS become chronic. The fact that limbic kindling can both cause and be caused by stressors, reflects the bi-directional relationship between the brain and the body, and the fact that the human body is a complex adaptive system where everything essentially affects everything else. The bi-directional nature of limbic kindling means what was set in motion by the body can be exacerbated by the mind. Niki proposes a multi-factorial mind and body approach to limbic kindling. The initial underlying causes of environmental sensitivities and illnesses like Chronic Fatigue Syndrome may therefore come from stressors directly acting on the brain and triggering biochemical changes downwards in the body, or via factors acting directly on the body triggering changes upwards in the limbic system through chronic inflammation. Physical factors which can lead to chronic inflammation and thus limbic kindling include chronic infections, type IV delayed hypersensitivity to toxins, and food and gut inflammation. In a second paper by Jason et. al. on kindling theory and ME/CFS in 2011, the authors argued that inflammation from chronic infections could also cause limbic kindling. Factors linked to psychology which may help perpetuate limbic kindling or accentuate sympathetic nervous system activation in ME/CFS could include personality issues such as proneness to being an over-achiever, anxiety, or being an excessive “helper” type (16-19). Emotional trauma in childhood is a well-established risk factor for the onset of Chronic Fatigue Syndrome (and other inflammatory/autoimmune disorders) in later life (20-23). Effective management of the emotional stressors associated with chronic illness (which is traumatic in itself) can be a major factor in recovery for some patients (24, 25). Commonly used psychological or energetic techniques for CFS and other disorders of sympathetic nervous activation include NLP, CBT, EMDR, yoga, Qi Gong, Mickel Therapy and meditation (16). Heavy metals may also be involved in limbic kindling. Dr Stejskal, the researcher involved with developing the Melisa test for type IV hypersensitivity to heavy metals has completed numerous large studies confirming metal sensitivity in ME/CFS patients (discussed in CAM , November 2013). In Neuroendocrinology Letters in 1999 Dr Stejskal discussed studies linking inflammation to heavy metals accumulation and concluded: “Chronic metal-induced inflammation may dysregulate the HPA-axis and contribute to fatigue”(28). The authors went on to state that xenobiotics such as formaldehyde and isothiazolinones would have a similar inflammatory impact and that the genetic ability to detoxify xenobiotics, together with the individual susceptibility to the toxin, are probably the most important factors in whether a person develops sensitivity. Other sources of chronic inflammation can include delayed type IV hypersensitivity to foods, especially gluten ( CAM , September 2013). An extensive referenced discussion of the links between gluten sensitivity, gut inflammation and CFS can be found on this website HERE. A key point to take away from the limbic kindling model is that a nervous system that has become sensitized/programmed to overreact to toxins and other substances may require different interventions. Mind/body approaches may help to reset the neural reprogramming found in some people with sensitivity to toxins. Other approaches include sauna, chelation and nutritional supplementation. While the intervention for type IV delayed immune system sensitivity to a toxin entails testing for and removing the toxin from the environment of the patient, and the intervention for genetic polymorphisms affecting methylation and other detox pathways may entail recommending a “nutritional bypass” to modulate and improve detoxification, sensitivity to toxins due to neurological reprogramming may be served better by interventions to reset the unconscious amygdala – such as NAET therapy, a form of non-invasive acupuncture therapy, or similar energy-psychology techniques such as EFT (tapping). Other physical treatment interventions which should be accompanied by concurrent psychological support commonly include the Perrin technique for lymph stasis, cleanses such as sauna and chelation therapy, as well as nutritional support for metabolic imbalances including pyrroluria, porphyria, poor mitochondrial function, leaky gut, low adrenals and thyroid, chronic infections and immune system imbalances. Practitioners – and researchers – would be wise not to downplay or ignore either environmental or psychological factors that could help perpetuate the limbic kindling found in complex chronic illnesses like ME/CFS and MCS. Treatment interventions should ideally be concurrent and multifactorial. A comprehensive physical and psychological history and multi-faceted approach to treatment may yield the highest rates of success. 1. Goddard GV. Development of epileptic seizures through brain stimulation at low intensity. Nature 1967, 214:1020–1. 2. Gellhorn E. The emotions and the ergotropic and trophotropic systems. Psychologische Forschung 1970, 34: 48–94. 3. Girdano DA et al. Controlling stress and tension. A holistic approach. (Prentice Hall, 1990). 4. 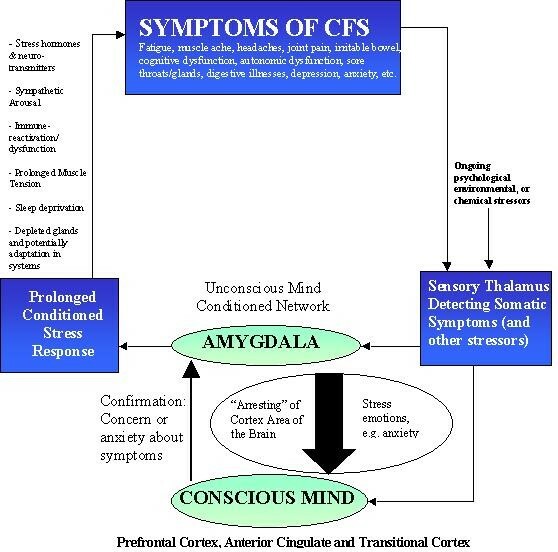 Gupta A. Unconscious amygdalar fear conditioning in a subset of chronic fatigue syndrome patients. Med Hypoth 2002, 59: 727–35. 5. LeDoux J . The emotional brain: the mysterious underpinnings of emotional life. (Simon & Schuster: 1996). 6. Hull AM. Neuroimaging findings in post-traumatic stress disorder. Br J Psychiatry 2002, 181: 102-10. 7. Jason LA et al. Kindling and oxidative stress as contributors to Myalgic Encephalomyelitis/Chronic Fatigue Syndrome. J BehavNeurosci Res 2009, 1, 7(2): 1-17. 8. Bailey MT et al. Prenatal stress alters bacterial colonization of the gut in infant monkeys. J Pediatr Gastroenterol Nutr 2004, 38:414-421. 9. Bailey MT, Coe C. Maternal separation disrupts the integrity of the intestinal microflora in infant rhesus monkeys. Dev Psychobiol 1999, 35: 146-155. 10. Lakhan SE, Kirchgessner A. Gut inflammation in chronic fatigue syndrome. Nutr Metab (Lond) 2010, 7: 79. 11. McGinnis W et al. Discerning the mauve factor, Part 1. Alter Therap 2008, 14: 2. 13. Perrin R. The Perrin Technique. (Hammersmith Press: 2007). 15. Perrin RN et al. Muscle fatigue in chronic fatigue syndrome/myalgic encephalomyelitis (CFS/ME) and its response to a manual therapeutic approach: a pilot study. Int J Osteopathic Med 2011, 14 (3): 96-105. 17. Van Houdenhove B et al. Does high “action- proneness” make people more vulnerable to chronic fatigue syndrome? A controlled psychometric study. J Psychosom Res 1995, 39: 633-640. 18. Lewis S et al. Psychosocial factors and chronic fatigue syndrome. Psychol Med 1994, 24, 661-671. 19. Arroll MA et al. A qualitative investigation of everyday worries in individuals with myalgic encephalomyelitis and chronic fatigue syndrome (ME/CFS). Poster presented at the European Health Psychology Society: Cluj-Napoca, Romania, 2010. 20. Taylor RR et al Sexual abuse, physical abuse, chronic fatigue, and chronic fatigue syndrome: a community-based study. J Nervous & Mental Dis 2001, 189 (10): 709-15. 21. Heim C et al. Early adverse experience and risk for chronic fatigue syndrome: results from a population-based study. Arch Gen Psychiat 2006, 63: 1258-66. 22. Heim et al. Childhood trauma and risk for chronic fatigue syndrome – association with neuroendocrine dysfunction. Arch Gen Psychiatry 2009, 66 (1): 72-80. 23. Staudenmayer H et al. Adult sequelae of childhood abuse presenting as environmental illness. Ann Allergy 1993, 71: 538-46. 24. Van Houdenhove B et al. Victimization in chronic fatigue syndrome and fibromyalgia in tertiary care: a controlled study on prevalence and characteristics. Psychosomatics 2001, 42 (1): 21-8. 25. Howard A, Arroll M. The application of integral medicine in the treatment of myalgic encephalomyelitis/chronic fatigue syndrome. J Integral Theory Practice 2011, 6 (4): 25-40. 26. De Meirlier K, Englebienne P. Chronic Fatigue Syndrome: a biological approach (CRC Press 2002). 27. Leonard JA et al. An etiological model for myalgic encephalomyelitis/chronic fatigue syndrome. Neurosci Med 2011, 2 (1): 14–27. 28. Stejskal J, Stejskal V. The role of metals in autoimmunity. Neuroendocrinol Lett 1999,20: 351-64. Very interesting article on limbic kindling, particularly the statement that: “xenobiotics such as formaldehyde and isothiazolinones would have a similar inflammatory impact and that the genetic ability to detoxify xenobiotics, together with the individual susceptibility to the toxin, are probably the most important factors in whether a person develops sensitivity”. Exposure to toxic chemicals during an extended office renovation added MCS to my ME diagnosis, and caused a rapid deterioration in my health. Formaldehyde, in particular, became problematic, to the point I was able to detect new pieces of pressed-wood products in indoor environments immediately upon entering, even if they were extremely small, unseen, and located in the farthest corner of the building. At my worst, formaldehyde exposure put me into a trance. Living in a toxin-free home, and avoidance of risky indoor environments as much as possible, has lessened my sensitivity. However, I know it is still there, since my reactions to occasional, short-term exposure worsen during illness flares. NAET wasn’t successful for me. But, this article gives me hope that there may be help for those with multiple chemical sensitivities in the future. Thanks, Niki, for the article. A recent study did find a genetic susceptibility to MCS. It’s been a huge problem for me – I can’t imagine but that sympathetic nervous system activation – which I appear to have in spades – and limbic kindling doesn’t come into play with this. I’ve had a similar experience to yours: one of my triggers for ME and MCS was the move to a new office where I began to choke from the particle board dust. After heavy cleaning of my immediate surrounds the choking settled down. Then I began to get frequent sore throats, fatigue, more MCS attacks to new substances and the rest is a long downhill story. I had months of NAET mainly aimed at foods at that stage. I was attending until I was too sick to attend so it did not prevent my downhill slide and made no difference to anything else. Having said what I said, I doubt very much that the Gupta and other psychological stuff would help. If you have a brain and other inflammation induced by various pathogens and toxins, etc it seems ridiculous to say that relaxation, CBT etc would cure it all. I’m sorry to hear your experiences have been similar to mine. I agree — “psychological stuff” is not particularly helpful for many of us. Because I was exceptionally healthy/active prior to my upper-respiratory ME trigger, even I questioned my sanity, at first. Fortunately, the chief medical officer at my company had a family member with ME. She referred me to the psychologist “expert” in our city. I was very open with him, and every time I asked if perhaps there was a psychological cause for my illness, he said “definitely not”. Although I now realize he used a form of CBT in our sessions, the focus was on helping me to accept the limitations of a physical illness. On my own, I tried many self-help practices such as yoga, meditation, visualization, relaxation. None helped, and most just left me feeling more stressed. Being physically active had always been my stress relief. With respect to NAET, is it possible these treatments contributed to your “downhill slide”? Although Niki described NAET as “non-invasive” in her article, after every treatment I couldn’t focus my eyes for the entire rest of the day. Generally, I became increasingly more exhausted during the course of my treatments. In the concept, it is entirely possible that every single thing which is stated can be true — and maybe that is the case — and yet their final conclusions can be completely wrong. That is, taking lots of evidence which says, essentially, this happened and this happened and this happened — and this is why. But maybe that isn’t why. Maybe there’s a different answer, a different conclusion. …and the way to find what works in our case is by trial and error. That’s what it comes down to. I sympathize with the commenters on this blog who get a queasy stomach from reading not-100%-bullet-proof explanations of ME/CFS. At the same time I recall how–when I first got ill–I was desperately longing for an explanation for what was going in my body. And since nobody has a 100%-bullet-proof-explanation, I would have very much appreciated an explanation such as this. Cort, don’t be discouraged my the mixed feedback to this article. We’re all at different stages of our journey, and what might be repugnant to people at a certain stage of their journey, might just be what others need to hear at the stage they are currently at. We always have the option to not read an article if it’s not what we need at our current stage. Just read about a woman’s incurable myeloma being knocked into remission by a massive measles injection at Mayo. I know CFS/ME can be triggered by a measles vaccine. I wonder if the injection of measles could be used to stimulate the immune system to knock CFS/ME into remission. Are there any thoughts on this? I’d be a volunteer if they need one. How much o this anecdotal or small research can we take, Cort. I am frankly tired of it. More than tired of hearing it being reported. T seems to be related to the the 1001 theories that have been proposed and reported on. For Christ Sakes it has been 30 years. It is all about political action whether you see that or not, to get illness recognition and serious research dollars. I sometimes think I am going to puke if I have to read one more research report like this. I agree except I did puke! When will these baseless theories and stress end!!!!!! I disagree. While some portions (lymph, heavy metal, Gupta) are quite speculative, I think Niki describes a core process that is very likely to take place in ME/CFS; i.e. inflammation from infections, gut problems can cause SNS activation and limbic kindling – which in turn produces hypercitable neurons. That sounds like something that alot of researchers – from Lipkin to Hornig to Jason to Van ELzakker are talking about. With regard to Gupta I think it’s pretty clear, based on anecodotal evidence (but what else do we have?) that some people do benefit from that type of approach and lots of others probably don’t. Keep going, Cort. Dodge the spew; it is understandable and realistic that after thirty to fifty years sufferers reach their max of frustration and react strongly in public forums. Doing more active political action is essential too; in industrial countries the AIDS people got out in droves and networked powerfully until they got much of what they needed. We need multiple approaches to reach policy-makers and funders, each of whom may be perceiving different realities about NID, all of them partially true, based on their “level” of understanding they have reached in their overall personal development — and yeah, much of the time it comes down to just that in decision-making, personally and politically. (Internationally-renowned Integral philosopher Ken Wilber writes and trains specifically on this, and in 2006 he had a neuroendocrine immune event that almost took his life, so he knows much about this territory, and about enduring suffering while still being effective in the world.) The more perspectives a researcher, bureaucrat, politician can hold with multiple intelligences in play, and there are some actively out there, the more likely it is that they will finally act on getting this thing, our healing, DONE. There is some trial/error to every individual healing process, but how we have been left behind for decades is insane and possibly criminal. Cort, I just want to thank you for all your hard work! I have learned so much from your website. I bought Dr. Perrin’s book about a year and a half ago and my husband has been doing the osteopathic techniques (Perrin Technique) on me and lymphatic massage. Since then I have VERY slowly been improving. Since adding things that I have learned from your website, I have been improving even more. All the information that you print is important. Unfortunately with this disease there is not a one-size fits all cure. This is a multifaceted disease. I think you have to figure out what your trigger was and then do things in a certain order. Words cannot express how grateful I am for your dedication in trying to help everyone with this horrible illness. Glad to hear you’re getting some relief Larissa. …Laughing hard here. Your post was a tension breaker for me. I feel exactly the same way. I am almost terminally tired of the endless idle conjecture. I want symptom relief, and I want validation. I don’t expect a cure. But I am extremely weary of the doldrums where science has dropped anchor . When I go to a physician, I don’t want to have to restrain myself from swearing, from crying, from begging for help and respect. I suffer. And… the old becomes new. See Jay Goldstein’s “Chronic Fatigue Syndromes: The Limbic Hypothesis” published 1993 by Haworth Press. Which is not to say it’s not of value. Rather that Dr Goldstein was way ahead of his time. BTW NAET is not a “non-invasive” form of acupuncture. It is a very “out-there” “energy medicine” treatment based on applied kinesiology. I understand people’s frustration with the medical mainstream, but wish they wouldn’t throw away common sense along with it! Goldstein was way ahead of his time. CFS is in the brain. Still far too much time and $ wasted on looking for viruses. Viruses – along with other things – trigger CFS. They don’t perpetuate it. Oh my god! How many “could”, “mights”, “may” etc.,. can one endure in a supposedly scientific paper? I read a review article in Medscape on “small fiber neuropathy”. There were 1200+ papers on it’s influence on ME/CFS, Fibromyalgia, Idiopathic Cystitis and IBD. They immediately threw out over 1000 because all the data was patient reported. We need some real science or we are never going to get anywhere. We need the doctors like Petersen, Bateman, etc.,. to stop thinking they’re researchers and fight to get more money so our disease is recognized and researched on a real level by Universities etc.,. I agree with Gregory, Anne, Nina and VLynk. Show me the f$%ck*** MONEY. In other words show me the main goal here, treatment and cure. I don’t have much time left. I read Goldstein’s book in 1993, are you going to bring up kutapression and amantadine? Filling up pages with ancient news is not impressing us oldsters. I’m 26yrs and counting and I remember people telling me I’d be cured in 5 years, that’s of course the people who believed me. I’ll be “26yrs and counting” in October, so I can understand your frustration. When diagnosed in 1990, I was informed that society’s knowledge/understanding of ME at that time was equivalent to what was known/believed about MS 25 years ago. So, I assumed that by now, there would be successful treatments, if not a cure. I expected that the stigma associated with the illness then being referred to as the “Yuppie Flu” would be over. Boy, was I wrong. With all of the excitement in the patient community surrounding the Stanford and International conferences this spring, I was sure I’d find many supportive articles in the press that would validate our experiences. Wrong! I looked, and still couldn’t find any coverage except on websites (like this one) specifically devoted to ME/CFS/FM/MCS, etc. Then, the international awareness day on May 12 approached with much anticipation, and fizzled — at least in my part of the world. Despite my city lighting a bridge in green/purple/blue, there was no publicity explaining why it was lit. Based on predicted prevalence percentages and the city’s population, there could be as many as 10,000 sufferers in our area. Guess how many showed up for the lighting of the bridge? Four patients, three healthy supporters, and one dog! The city official who was supposed to attend was a “no-show”, thankfully. Had he come, I would have been embarrassed. I’ve always been very open with friends/family regarding my condition. Yet, two days ago I was told by a friend of 15 years that I “need to get my old bones out of bed earlier in the morning”. So, I guess I can add one more to the long list of people who don’t understand, or believe me. You are not alone. We have a long way to go on the advocacy front to get the funding for the kind the studies that everyone, including me, is wishing for by the heavy hitters like Lipkin and Ron Davis. But we gotta get the funding – and we gotta do the advocacy. We did a couple of advocacy blogs around International ME/CFS day; of the blogs done this month they were the last and third to last read blogs. This article is a very good one. I found this very interesting becuase it’s the firs time I’ve ever heard of a “sinus” connection. I’ve had chronic sinus infections for about twenty years, MCS about 15 years ago (almost completely gone becuase I changed my lifestyle to avoid triggers). And now I have ME/CFS/Fibro. My allergy/asthma doc doesn’t think there’s a link or predisposition between chronic sinus issues and Fibro, I asked him what percentage of his patients had Fibro becuase I was curious if the regular allergy shots I get could be a contributing factor (allergy shots = formaldehyde?). It surprised me to hear that it was very low, out of a practice of maybe 800 patients only one other had diagnosed ME/CFS or Fibro. This article was helpful for me becuase it gives me a clue that my chronic sinus infections could indeed play a part. I’m interested to try NLP and the Perrin technique. I did NAET for my allergies for 2 years and absolutely no benefit, huge benefit from allergy shots but questions about the MCS response to the preservatives in the shots. The theory that part of what is happening is a decreased ability to detoxify is also interesting becuase before I knew anything about CFS/ME or Fibro I described my “flairs” as a “3 week long hang-over”. That is helpful becuase it suggests avoiding things that require detoxification plus increasing antioxidants could be helpful. Please do keep bringing us diverse perspectives. If people are “tired of reading” the questioning stage of scientific investigation they can choose to not read it. This is a global theory or encompassing hypothesis which seems to include all the current fads in treatments and which could be used as a rationale for endless years and costs trying first one thing, then the next, which is what we have already had. Emotional arousal and stress as precursors setting off a cascade of other physical issues? Genetics, viruses and toxins too as possible precursors or amplifiers? Hypothesizing about patterns or pathways in body systems which might tie it all together? I am with those who want to see the money, the close scientific attention and specific research with practical and then proven applications for treatment, not more years cycling around the world of fads and unproven alternative care. I can believe that some of these treatments have apparently enabled a few to improve, but that is not sufficient reason to hold them out for all. If we each tried every single treatment and fad the alternative treatments world and regular medicine offers now, most of us would be exactly where we are–with ME/CFS, every day. I can look at this gently or harshly, with irritation or with laughter…but I don’t see how this current iteration of a global hypothesis about the causes and processes of ME/CFS–for which we don’t even have one single scientifically acceptable biomarker or treatment yet–really helps. I personally do not need or favor any more of these big hypothetical explanations, as they can function as rationales for a lot of treatments, particularly alternative care treatments, which in my experience are long on time, energy, expense and hope, and very short on results. Interesting article. I started on a beta blocker for POTS a few months ago and it has significantly improved my hypersensitivity, which is dialing. It’s not gone but I am very grateful for a reduction in this symptom. I have been in fight/flight mode for probably at least 15 years. Yesterday I forgot my meds in the morning and it was like someone had flipped a switch back to “on” position. Fortunately, I remembered after a few very challenging hours, and once I took my medicine I was back on track. I have also found meditation/mindfulness to be helpful overall, but certainly not a cure all. Meditation/mindfulness may be considered alternative by some but has been researched and is now taught in many medical settings for a variety of health issues. I find that a combo of meds, supplementation, and mind/body, some exercise, etc…. helps. I am still quite ill but just wanted to chime in on this thread. For both patients, clinicians, and researchers, solving and treating such a complex illness is like a never-ending jigsaw puzzle. (and the same “piece” may not work from one day to the next or for many patients– aarrgghh). I don’t agree with everything in the article, but that’s okay. I was surprised to learn recently about the extensive effects of beta-adrenergic receptor antagonists (aka beta blockers) on the brain and preliminary but intriguing trials using low dose beta blockers in autism (given the problems with sensory hypersensitivity/sensory integration in ASD plus the Lights’ findings and proposals for the the use of low dose propranolol for ME/CFS). oops. meant to say “disabling” not dialing. “It may be the most exciting concept in neuroscience that most people have never heard of.” A lot of nonsense! A “nutrtionist” is not an expert on neuroscience and Niki Gratrix is a “nutrionist”, whatever that means. No, this is part of the Reeves et al attempt to make this disease look like a psychiatric one. Childhood experiences are NOT “well-established risk factors” and chanting it over and over will not make it true. What an insult to all those parents of children with ME. The inference is that a high percentage of them must have abused their children. BTW, none of the links to CAM magazine work. I sometimes wonder if the chronic stress of my childhood (and having been born 15 minute drive from Lyndonville, NY) set me up for ME/CFS. I hardly believe it was the sole contributing factor, of course. However, I can’t rule out that it was one of the straws. I agree, we cannot afford to psychologicalize this illness, time is running out for many of us. While I find the article interesting, esp. in regard to MCS: I have to agree with the other commentators that we cannot afford to spend time/energy on this kind of speculative research. It’s not that I don’t appreciate Cort’s effort in posting this, but I think we need to go with more recent studies: spinal fluid immune activation, PET scan, and potentially Lipkin’s study. Pardon my ignorance; but, what is the significance of having been born a 15 minute drive from Lyndonville, NY? Adverse childhood events (ACE’s) are actually strongly associated with inflammatory disorders in adults. I was quite surprised by this. (I don’t have any ACE’s by the way). That study was not necessarily designed to make people feel guilty and it did fit ME/CFS in a mainstream of other disorders and the findings actually strongly suggest ME/CFS is an inflammatory disorder. How about that! Lung Cancer – http://www.ncbi.nlm.nih.gov/pubmed/20085623 – and this is just the beginning. The evidence appears to be really strong for this link. Thanks for pointing this out, Cort. I was just about to state the same: While not unique to ME/CFS, adverse childhood events are precursors to all kinds of inflammatory illnesses. Indeed! I was surprised at how much evidence there is of this. I don’t think the ACE study by the CDC helped us -but I was surprised to find that it fit in with a lot of other studies on other disorders. I’m with Iquito on this. Lots of theoretical conjecture that could be promising, but leads to the “childhood trauma” hypothesis AGAIN, and a variety of mostly psychological approaches to treatment, AGAIN. I am all for body-mind medicine that is equally applied to all illnesses and not slathered over ours alone. Would anyone settle for the treatments mentioned here for cancer? So many of us have tried most of the treatments suggested here, and while they are helpful for making peace with loss and living in this moment with gratitude, we remain seriously ill. I appreciate your coverage, Cort. It’s just so discouraging. It seems like the somataform folks keep winning the day. Meanwhile, to paraphrase another of us: I want a medical treatment, not a Freudian one. I find that I can always tell when I’m coming down with something, because the symptoms of my CFS greatly lessen just before. That’s probably because the virus I’m getting is being fought and the stimulated immune system tamps down the CFS. Also, this started as a flu-like illness. For that reason, as well as others, for example the variability of the symptoms throughout the day, tell me that this is a virus. I like the theory that it exists in the B cells – that would explain the relief experienced by the rituximab. If this was due to toxicity I doubt the above observations would apply, which doesn’t mean it isn’t. I have just attended an ‘Explain Pain’ session recently where it was said that an image of the foot having damaged the big toe, once healed produced hypersensitivity in some people. This was due to chemicals from the injured toe opening up extra gates in the nerve,causing more chemicals to enter, which ran up through the central nervous system and caused the brain to overreact. The main nerve coating being ‘worn away’ in places caused extra small nerves, to shoot out from it. There was no mention of ‘nerve damage’ i.e. to the myelin sheath and emphasis was placed on ‘pain does not cause damage’. No, pain is there to warn of damage surely and extra care to be taken with smaller nerves, as they have taken over the job from the damaged main nerve? When I asked, why do the chemicals open extra gates in the first place, the physiotherapist, said they didn’t know why!! Isn’t this a fundamental question which needs scientific answers, before everything else is assumed with such a complex area as the brain’s overreaction (hypersensitivity)? Is there any research on that please Cort? Very interesting. This theory explains quite well why people with gastroesophageal reflux sometimes develop chronic esophageal hypersensitivity (like myself). I didn’t suspect it can also explain CFS. Good to see Svet again :). What is esophageal hypersensitivity? “A hypersensitive esophagus has a lowered threshold for symptom perception and reporting”. Example: if I cough or sneeze on an empty stomach, I have pain for weeks (plus other very bad symptoms, including fatigue nausea etc). Stimuli which trigger the condition can be mechanical (as in my example), or chemical (certain foods). Btw limbic kindling is just one example of sensitization, another one is central sensitization. I understand people’s frustration with all the theories, but boy does this one resonate with me. It just makes a great deal of sense in terms of my 20 years experience with this illness and my training as a biomedical researcher. Regardless of the speculation, theory and hypotheses about ME/CFS and Fibromyalgia, I am constantly grateful for Cort’s exceptionally researched posts here on his site. I learn the most from this one site about my condition, what is happening in the world regarding research and potentially useful treatments, than anywhere else online. Cort, every time I read one of your posts I remind myself I need to buy a printer just to collect this fantastic information to present to my family doctor (when I find one lol). I appreciate your efforts more than I can say Cort. Thank you. BTW, I’m not dissing Goldstein’s theories. He did more to help me than anyone. Problem is, no one listened to him. He was (is) truly brilliant, but not the best at communicating his thoughts to the world. If some of the latter-day researchers would sit down with his writing and try to understand it, I think good things would come of it! It’s a trend that happens in all research fields, in which someone identifies a key concept, and then it is forgotten as other, less reasoned theories arise, and then the idea is rediscovered, often several times before being recognized for its true value. Do keep up the good work posting your analyses of ideas and theories as they emerge, Cort. I admire your perseverance and (apparent) energy! Goldstein was very close to the answer back in the early 90s, with the limbic system in the brain. There has been 20-odd years essentially fruitless search for viruses. Many in the CFS community still seem to cling to an answer there. Some in the research community do too. In terms of serious research (serious sounding, at least), any word on Pridgen’s results? It’s been a quiet couple of months since the “game changer” comments. I have no information of the results, but I have been taking the therapy for six weeks now (slightly modified) and would agree it is a game changer. Six weeks is not long enough to be as confident as I would like, but I am very, very optimistic. I developed juvenile CFS/ME and adolescent FM almost 30 years ago so did not have big expectations. Thank you for this comment, Luke, I 100 percent agree! I don’t know what’s going on with Pridgen. My guess is that all is well and that it’s just taking more time. Please see my comment below with regard to your next article and this one Cort. I wonder if the two theories counteract one another? Thank you for this revealing article Cort and if this is the case for muscles then my comments regarding nerve preservation, in this article, i.e. small nerves burning after being produced to warn of main nerve damage, rings even more true? Our nerves are there to protect us from hurting our bodies. Without warning signs e.g. blocking signals, we could do ourselves harm without realising. Thank you Dr Bateman and the Lights. I’ve seen Ashok Gupta’s self-help ‘course’ for ‘amygdala retraining’ and I can tell you it has no content which gives any clue about how to get better. There’s a large sheet of plastic to stand on and lots of video testimonials – but how many of the subjects had M.E? In Gupta’s book he says he is not offering a ‘therapy’ and then later refers to his therapy. A clue to his motivation may lie in where his ‘clinic’ is located – Harley Street – home to expensive health practitioners of all sorts. As for ‘tapping’ – I wish I had the energy and stamina. Then there is “Emotional trauma in childhood is a well-established risk factor for the onset of Chronic Fatigue Syndrome (and other inflammatory/autoimmune disorders) in later life.” I profoundly disagree; a few psychologists have put the theory forward with very little evidence of any kind. Just look at what the psychos are currently trying to claim as conditions which they need to treat – shyness, cleanliness, etc. They’ve done it repeatedly in the past – MS was a form of ‘hysteria’, stomach ulcers were caused by ‘stress’ – all bunkum which the psychos got away with for years, and they’re still at it. Mind you, having said all that, I must add that I do appreciate your hard work in keeping the site up to date with so much really good content – keeping us informed; thank you. The cause is inflamation of the brain. – is it the cause, or is it the process? Does the brain inflame on its own? Ah! the notoriuos personality research, branding a whole comunity of sick patients as weak minded and to blame for the situation they find themselves in. That research did untold harm to the ME community that still persists today. The researchers took what are fundamental human traits (wish to acheive, helpfulness etc) and turned them into some kind of abborant personality traits that make people sick. What nonsense!! The human race is so strong it has survived thousands of years and dominates the planet. You only have to look at the third world to see what real hardship people can survive and strangley they don’t fall ill with ME!. When it comes to the abuse in childhood question, that’s life, things happen, how many of us could not think of of some incident in childhood and tick that box, just about everyone. I have two sons and a daughter who have severe ME for 26+ years those papers belittled their suffering and were so offensive! To me this article was a mish-mash of just about everything. I too am fed up with pseudoscience and dodgy therapies, real biomedical science is what we desperately need. The work of Dr Goldstein is probably of great importance for FM patients ( I tried to understand his books). Next to Dr Bauer he is the only one who realised quick, real results. But what with the folluw-up of the patients? As I understand from reading his books patients were sent home to be treated further by their local meds. Did they remain well? or did they relapse? Good to hear from you. I couldn’t agree more!! I have just read through the article and all your posts. Respectfully. The more I read about this (and live with something similar but without diagnosis) the more I am convinced that this is all due to the major shift in the way we live. AND that shift is made up of many different shifts which affect some people and not others and also probably affect some people differently and likely depends also on what they have been exposed to. As a health practitioner I have had plenty of opportunity to observe many manifestations of CFS/ME and I am inclined to think this is the tip of a much wider problem within our organism. I am particularly sceptical (but remain open) to mainstream medicine solutions – if only they would take this seriously. I do think there are pieces of the puzzle already available to us – just depressing that no magic bullet is in sight. These articles Niki provides give us many clues, some which may resonate, or indeed some not. However if you are privy to observe other illness manifestations of just about any type; magic bullets do not exist for them either. To reach any kind of ‘health’ there are always compromises. Your compromises are likely to be entirely individual to yourself. The major shift in the way we live is not going to go away. We must learn to adapt, using information we know helps us, whether it helps the next guy or not is immaterial but we should remain open to it. Managing limbic kindling can help you feel better. I’ve been doing it for 5 years, without knowing about the theory. What I suggest is not a cure, but can help you live with the illness until a better answer is found. About a month ago, I finally floated an idea past my doctor basically saying that the mind gets confused as to the level of threat, and badly over-reacts. The threat can be infection, environmental, or just a jerk, but the ‘threat’ gets overblown into the fight-or-flight thing at the drop of a hat. Once kicked in, it takes days to calm, and in the meantime we’re screwed, especially if we didn’t recognize it as a ‘threat’ consciously. I told him the brain just automatically goes into hyper-sensitive mode, and the more ‘threat’, the more symptoms. When ‘threatened’ some of our systems screw up (digestion, sleep etc. ), systems not needed for escaping the sabretooth tiger (survival – oldest part of the brain). The kicker is, I had no idea about this article or that such a theory existed until today. But, I think this limbic kindling is the heart of the problem. When I got so sick 25 years ago, the immune system thought it was too close to dying, and ramped up the hypersensitivity to ensure we listened. Now, the remembered response just kicks in so easily – I say 20X as sensitive as before, for me. This limbic kindling is also why calm is so important for us. For the past 5 years, I have followed this theory alone, and every time I got sicker, I could see where the brain got confused as to the level of threat. It’s also why we all cling to whatever we think helps, so desperately – because it helps being calm. For some people it’s naturopathic stuff, for others meditation, others again use medical marijuana, and we all have that one thing we think helps, and brings us a bit of calm, almost like a placebo effect, but really it’s just resetting what’s screwed up. This illness IS in our mind, just not our conscious mind. But, I’m not saying it’s psychological just that the brain’s chemistry kicks in too easily when ‘threatened’. If you are already sick, simply worrying about it can make you worse – really. It keeps the brain in fight-or-flight mode. A real threat is overblown more, which is perhaps why heart problems are an issue. I think the reason the immune system is always on edge is that there is still something seriously, physically wrong, and anything extra pushes us over the edge. Anyways, my doctor was fascinated and talked to me afterwards saying I should write a book, because he’s seen patients where this theory makes sense. I feel getting the info to Cort may help more people than writing any book. I’m reasonably functional almost every day now by recognizing that whatever kicked me in wasn’t truly a threat after all, and symptoms improved. Truly real threats will still put you down. It’s why things like the Lightning Process can help but wasn’t the answer – you can take yourself back to a calm place – just not ALL the time. Recognize that your sub-conscious is registering a ‘threat’ and over-reacting, hyper-analyzing. Being consciously aware that it wasn’t, indeed, a threat and symptoms will improve. But you have to get people who keep you triggered out of your life to make this work. Very interesting Perry. A good deal of research suggests that sympathetic nervous system activation (fight or flight) and parasympathetic nervous system inhibition (rest and digest) is a problem in ME/CFS. I tend to focus on those studies (check out the ANS category, I think, in the HR blogs) because what you experience of being threatened all the time fits me to a T..
Getting it to calm down, though, is not easy! I get some relief for sure from stress reduction but it’s so fixed in my system that I have to belief that there’s a physiological basis. I would not that SNS activation will do in your immune system over time. Yes, getting it to calm down can be impossible sometimes. The over-reaction is ridiculous. Unfortunately, avoidance works best, but guard against never going anywhere either. But, the very act of recognizing what triggered you and that it really ISN’T a big deal can start things to reset. As long as nothing is irritating on an ongoing basis. All I’m saying is that it can really help. As for your psychological basis, I think it has something to do with losing faith in our bodies & minds to do what we want, when we want it. We’re so over-protective that we eventually end up anxious. Anxiety was not a big issue for many years, but has gotten worse in the past decade. So, my suggestion is the psychological part isn’t a basis of the illness, it’s a result. Thanks for the article Niki, and thanks for publishing it Cort. I found it both interesting and helpful. While I am as keen as any of my ME contemporaries for mainstream medical advances, I think the marginalisation of us as a patient group has led something of a bunker mentality. Anyone who is waiting for the cavalry to arrive may be disappointed. Which is precisely why I think this article is a valuable contribution. Partly at least I have come to view ME as a disease of modernity – we are exposed to a cocktail of novel elements in our air, food chain, living spaces. Global travel has exposed to many pathogens we would probably not have encountered in a settled, pre-industrial society. Not all of us have the metabolism or genetic inheritance to survive this well. The bugs themselves may also be beefed up via a variety of mechanisms. The Victorians in the UK lived with a startling assortment of toxicities in the process of industrialisation. And of course, Victorian women who stayed home with their arsenic-laced wallpaper, lead paints, gas-lit front rooms got sick. And were told they were hysterical.. Given that, why wouldn’t we want to look at mechanisms whereby our brains and immune systems may be impacted? As for ACE’s and PTSD, I am in recovery from both, and without doubt my early acquisition of hyper-vigilance and the long-term impact of trauma screwed with my endocrine system, like any prolonged stressor. I don’t why get its considered flimsy or puke-worthy to try and address this? It helped me, as did changing my environment, getting the right meds for underlying infections and to support my endocrine system. I am far from cured, but now I function. None of those avenues were open to me within conventional medicine. What works for one is not what works for all. I dislike any therapy that holds itself up as a cure, whether alternative or mainstream. There isn’t one. And we don’t all have an identical path forward. So does that mean Cort should stifle any speculative articles? Doesn’t that just make us like those who call us hysterics and malingerers in the first place? I know my subconscious mind plays a big part in my symptoms, though of course not the whole story. I remember a time when I had recovered from my first bout of ME. I was standing at work perfectly well when someone came in and gave me some stressful news. Immediately my legs developed the ME type muscle pain and symptoms re appeared. I calmed myself and talked myself through the apparent threat and after an hour or so was OK again. But that experience has stayed with me. However, I have had this bout of ME for 13 years, some of which has been very severe. Perrin technique, supplements, meditation, STOP process all help, but I’m far from recovered. I know that the best thing I can do though is to always work on being in a calm healing state. It helps symptoms and helps me emotionally too. Not suggesting it’s easy……….